I have a two questions when graphing EMG date using your software. 1. When I produce an EMG graph with a LE, the software produces an iEMG value as a %. For example, iEMG = 10.9%, or IEMG = 22.0%. My question is, what does that % represent? 2. If I produce a graph choosing the "integra"l option, it gives a y-scale of %-S. What does %-S refer to? Sorry for my EMG ignorance! 1) Consider 2 areas, the first being the area under a curve and the area of a rectangle that has 2 sides along the 2 axes and is just large enough to include the data points. The % being reported is the percentage that the area under the curve is of the rectangle. 2) When you select to make a data graph, you have several options for y axis normalization, one of which is "%". When this is selected each data point is presented as the %Max for the data. If you select "%" for y normalization when creating an "Integral" graph you are first "creating" a set of data points that are "%Max" and then integrating them over time. The units are "%-Sec" because the data points have units "%" and we are integrating over time. There are many different graphing options that were added to the software at the request of a number of researchers. They allow one to look at data in many different ways. However, I think it is fair to say that some people will find certain data displays useful and others will not. Each DataNew[i] is the %MAX for the ith data point. This becomes the data for the graph. If a regular data graph is being created then the Y-axis units would be % because all of the data points have been converted to %.When making an Integral graph values are being summed over time. So the units for the integral are the units for the data times the time units for the data. Consider this senario with no Y normalization. If you had force plate data in pounds that you were integrating over time in seconds then the result would have units in "Pound-Sec". However if you create an integral graph selecting "%" y normalization then the data points are first converted to %Max resulting in units "%" and then integrated over time in seconds resulting in units "%-Sec".I can't guarantee that making an intergral graph with % y normalization will have meaning but it is an option if you think it does. Thanks for the message. The APAS hardware installation is described in the following document. Let us know the Level and Flags that are marked. Send this information with the System Parameter and Site Code numbers from the computer. We will return the Site Key that will activate the Analog software. After solving one problem there is always a new one so we'll never be bored. Let us know the Level and which Flags are selected. Also send the current Site Code for the APAS computer. Make certain you follow the instrucstions otherwise the APAS software license may be erased and result in additional charges for a new license. 1. Try using an older version of the Instacal program (the software is on a CD-ROM that was delivered with the original system) and see if the problem still exists. A/D card for use with the Ariel Performance Analysis System (APAS) and are ready to use the ARIEL ANALOG program. You have successfully installed and connected the ComputerBoards Congratulations! 4. Close the InstaCal window. 2. The Plug and Play Board Detection menu will then be opened. This menu will display any boards that were detected during the bootup process. Make certain that the PCI-1200JR board has a checkmark in the indicator box. Select OK to proceed. 2.Select Start Menu Select SETUP.EXE and then OK. Select the drive where the InstaCal disk or CD resides. Select RUN and then BROWSE. located in the lower left corner of the screen. 1.Insert the InstaCAL disk or CD into an appropriate disk drive in your computer. 6.Reconnect the power Windows 95/98 will automatically detect the board as it starts up. to the back of your computer and start your system. 5.Replace computer cover : Replace the screws that hold the cover in place. 2.Locate vacant slot: Save the screw for step #4 below. Locate any vacant PCI expansion slot and remove the expansion slot screw and cover. 1.Shut down Disconnect the power cord and remove the computer cover. and turn off your computer. .www.computerboards.com For additional information, see the ComputerBoard web site: This quick start procedure will help you setup, install and test your board quickly and easily. The PCI-DAS1200 series boards are easy to use. is correct, there was a problem when we used the new version of the CB setup. CANA could not execute because the system could not find something or another. We solved the problem by going back to an older version of theeir Install. the phone as I have almost no e-mail regarding it. Stan & I are both correct on the issue of powering electrodes with the new CES 16 channel board. If the board does NOT have the DC-DC converter installed on the board, there is no on board power for the electrodes and 9v batteries must be used. However if the DC-DC converter is mounted on the board then it can power the electrodes depending on the setting of the jumpers. With CES, the DC-DC is always mounted. I have installed the PCI analog board in my system & I think I understand the nature of the problems which have been encountered trying to get the PCI version of the boards working. It basically boils down to this. The board will not work properly if it is sharing an interrupt# with another board. It is easy to check this. Go to Device Manager, highlight "Computer" and click on the properties button. A listing of the interrupt#'s and the boards which use them will appear. Int #9 is where I find my A/D board. If there are other boards listed as using this same interrupt the A/D does not work. If you find another board using this interrupt go to the properties for that board and check the "Disable" checkbox. You do not need to re-boot the computer. The device should become disabled. Now try the Analog program. It should work if all of the sharing boards are so disabled. I contacted Computerboards about this & they confirmed that the board indeed will not work if there is interrupt sharing. They have a fix in the form of an updated version of CBW32.DLL. Their WEB site is currently down. I will get it as soon as I and check it out and send it off to you if the problem is solved. Yes, the interrupt problem is a problem we know about and we do go ahead and try to isolate the board to it's own IRQ. But we still see a problem that when we first install the board in a new system by itself(video card only other card installed) the APAS analog will not see the board. This board on this computer is on IRQ5. I then put the board back in the original slot on IRQ5 and it still works with the analog program. Not a big problem for us, but it is consistent for the last few systems we put together. Thank you for your message. The specifications for the Ariel analog board are listed below. Please contact us for any additional information. You can speak with myself or Stan. The exact connections for the modular connector were faxed to Mr. Lawrence Klein of Thought Technology on August 1996 and again in November 1996. Each channel on the Ariel analog input box has the option of BNC or 6x6 modular jack connectors. > person? Or should I speak directly with you or someone else? > number is good to call, (949) 858-4216? Clearly a number of the settings are wrong. This is how they should be set. problem was fixed regarding sampling times. the duration was 12 sec at 1500 Hz. >If you open trial 1 (900 hz, 12 sec) then the duration is less than 12 sec! (v 3.5 dated 5/20/99) but I diod not have time to check it out. I'll do it. >>Please e-mail me your data & I will have a look. >>posted on the WEB site. What date did you perform the download? >>best if I had a data file. >>We will get these problems cleared up immedeiately! >>present for Fx, Fy, and the moments. >>sec were shown for the 6 channels of AMTI collected data!!! >>>4. When i collected for 12 sec, it showed up 18 sec of collected data . .
>>always nowhere close to reality. There are many ways of doing it. One of the simple one is to build a pulse generator. It cost around $5 in Radio Shack. Then you use a switch to light a LED or any light that the camera can see and in the same time send a 1 or 2 volts to one of the A/D channels. This synchronize the camera with a signal on the A/D and if you have EMG on the other channels you can synch them accordingly. Another simple method, is to put a large monitor in the background of the video location where the camera can see the monitor. Then use the Oscilloscope function for the EMG and you will see the movement and the monitor in the background with the EMG signal appear on it to synch the two. > used and I have thought about using footswitches. > I would be grateful for any such information. as usual, thanks so much for your prompt response. > I hope this information is helpful! > >> for your system. > >> the Ariel bibliography. > >> >need it for 2 semesters, if it's OK with you. > >> >My computer is an IBM Aptiva, Pentium 200mHz, 64 MB RAM. > >> >and I'll send it right away. > >> >cold, and I have a lot of work to do to finish this thesis. as this is the applied force perpendicular to the top surface of the plate. by setting this value to a large negative number (-999 for example). the keyboard as the trigger. Also, make certain that the trigger channel in one of the active channels. The last active channel is indicated in the LastCh entry under the toolbar. then the sample will not be triggered. >parameters are sat but, somehow, we cannot triger sampling in Analog Modul! >By the way, is there any way to start sampling from the keyboard? 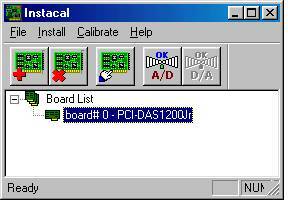 repeat, according to the InstaCal program, the A/D board works. >as this is the applied force perpendicular to the top surface of the plate. >by setting this value to a large negative number (-999 for example). >the keyboard as the trigger. >Also, make certain that the trigger channel in one of the active channels. >The last active channel is indicated in the LastCh entry under the toolbar. >then the sample will not be triggered. >>parameters are sat but, somehow, we cannot triger sampling in Analog Modul! >>By the way, is there any way to start sampling from the keyboard? The Analog hardware/software included in your original APAS computer is based on the DOS operating system. Technology has changed drastically in the last 4 years. The current hardware/software operate from the Windows environment. Unfortunately, the DOS based hardware will not operate in the Windows environment. The Windows system requires new hardware and software. The same is true for the video hardware. The "new" APAS computers include Digital Video frame grabbers that are not compatible with the "older" analog video frame grabbers. The JVC 9800 is a digital camcorder that takes advantage of the new frame grabber. If you wish to purchase the current APAS with two JVC 9800, you could use the "new" computer for the video data collection and keep the "old" APAS for collecting analog data. If you wish to collect data on the "new" computer, then you must purchase the analog hardware & software. Dear Mr. Probe Last November I had received your e-mail that propose 3 option for updating our APAS system (its 4 years old in windows 3.1). Now we strongly intereste to buy the APAS software with two JVC 9800 camcorders. We have also the 16 - channel Analog Hardware-software(connect the Kistler force plate and EMGs). How it is possible to work together the new APAS software (that included in the package of $10,000 USD) with the our old analog hardware? Please send me more informations. Thank you in advanced. Best regards Petros Tsintzos isplus@spark.net.gr or Christos Papadopoulos, Ph.D.
answers below each of your questions. have listed the direct address to specific areas of interest. >1. Is it a separate module- can I buy it without video system? one would require the following APAS items. would be $16,500.00 USD plus shipping charges. >2. How many channels use this system like analog inputs? The standard Analog Module is 16 analog channels. >3. Which is frequency band of these channels? >treatment of signals. What kind of treatments do you have on it? >I'll be very glad if answer me and if we keep contacts in a future. You should now be able to sample from the force plate. If you still experience problems, look at the IRQ's for all the computer hardware and see if anything else is conflicting with the A/D board. 6. Then select the CALIBRATE icon. 5. Double-click on the board to set the parameters. Make certain the board is set fo 16 single-ended channels. 4. Repeat step 1 and run the Instacal program again. The software should automatically detect the A/D board. 3. Exit the instacal program and then reboot the computer. 2. Remove ALL boards that are shown by highlighting the board and then select the Remove icon. 1. Select START, PROGRAMS, COMPUTERBOARDS and then run the INSTACAL program. Thank you for your message. The reported problem most likely indicates that the A/D board has not been installed correctly and there is a hardware (IRQ) conflict with other hardware. Generated on 4/20/2019 3:12:17 PM (PST) ADI/HQ/GBA/2019/ARIELCLOUD/v3.0.2018.0126.